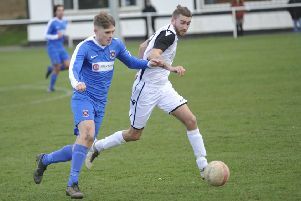 The Bexhill College men’s football academy has enjoyed a successful season, with all three of its teams finishing in the top four of their respective leagues. The academy, which is run in conjunction with Chelsea FC Foundation, has thrived this year with more than 40 students enrolled and representing the college in regional and national leagues, as well as cup competitions. The academy’s first team finished second in the U19 Sussex League, missing out on top spot by a solitary point. With exceptional results such as a 15-1 win over Sussex Downs and a 13-0 victory against Varndean, and scoring 21 more goals than any other team in the league, the college has been prolific in front of goal. First team manager Rob Wratten said: “The players have been superb this year. It’s been a real pleasure working with and developing such a dedicated bunch of players. The college’s second team also finished second in its league, missing out on first place by three points. Winning 10 out of 11 games and only conceding nine goals all season has made manager and football academy director Sean Noble immensely proud. He said: “Each week the team has become better and better. They have been dedicated in training and have really shown a commitment to succeed. Bexhill College’s third team also had a successful year, finishing fourth in the same league as the second team and only missing out on third place on goal difference. The team is coached by Lewis Parsons, who, like Noble, is a UEFA B licensed coach. He said: “The real success is the development of the players, with some of them representing both the first and second teams at various points of the season. The football academy will be hosting trials for both the men’s and women’s academies in the coming weeks, and players are encouraged to apply online at www.bexhillcollege.ac.uk for an opportunity to attend.